Initially, the user enters one or more protein identifiers (almost any identifier type can be used, from UniProt, nucleotide sequence (mRNA) and gene accessions or names to GO terms and chromosomal regions). The system maps those identifiers to entities of the PICKLE RHCP (reviewed human complete proteome) genetic information ontology network and returns the candidate list to the user for review. a) the PICKLE network normalization level (i.e. UniProt or Gene), b) the PICKLE network filtering mode, i.e. none, standard or cross-checking (default) - see PPI filtering ruleset in next section -, and c) the PPIs which the system will retrieve from the respective PICKLE network. a) the interactions of the queried biological entities, retrieving thus their “first neighbors”, or b) the interactions of the queried entities and any interactions that may exist between those first neighbors, or c) the interactions, if any, exclusively between the queried entities. The resulting interacting pairs are formatted in such a way that the first displayed interactor is always a queried entity. The interactions are sorted based on their cross-checked confidence score of a PPI, their standard confidence score (see PPI confidence scoring scheme in next section) and the total number of supporting publications, the links to which are also provided. The user can download the resulting PPI set in a tab-delimited format and/or visualize it (if size permits) via the Cytoscape.js visualization plugin. The user can also retrieve the source information about the identified PPIs as this is recorded in the primary datasets along with the quality evaluations of the supporting experimental evidences ('details' link). In PICKLE, what we call ‘evidence’ is an evaluated set of attributes provided by a source database regarding a specific PPI. As of "first-class" standard quality are evaluated the sets of evidence attributes that suggest a direct protein-protein interaction. This category includes all evidence sets, in which the interaction type (if provided by a source database) indicates a direct interaction. In these cases, we trust the respective designation of the source database curators, regardless of the rest of the supporting experimental data, i.e. the experimental system and/or detection method and the throughput (in the case of BioGRID and DIP) or expansion method (in the case of MIntAct). Even in the case of other interaction types, a set of evidence attributes is still evaluated as “first-class”, if the description of the supporting experimental setup accounts for methodologies capable of detecting direct interactions with a high degree of confidence (e.g. a yeast two-hybrid system). The “second-class” evidence sets may suggest direct protein-protein interactions, but are subject to questioning and can be downgraded to a lower class designation given contrary information from other databases (i.e. database cross-checking). In the case of the "third-class" evidence attributes, the described protein-protein interactions would be considered of low probability of being direct. As "fifth-class" are evaluated the sets of evidence attributes that refer to interactions between proteins and genes or nucleotide sequences (mRNAs) . Protein-gene or protein-nucleotide sequence (mRNA) interactions are stored in PICKLE for primary PPI dataset cross-checking purposes only and are not included in the PICKLE PPI network. All genetic interference interactions (either in terms of interaction type or supporting detection method) in MIntAct, BioGRID or DIP are a priori discarded. The sets of evidence attributes associated with primary PPIs assist in the definition of a standard scoring protocol for the confidence level of a PPI being direct. Employing ontological PPI integration, PICKLE enables the cross-checking between the primary PPI datasets in the cases of curation overlaps, leading to further refinement of the standard PPI confidence scoring protocol. In all cases, “first-class” evidences retain their classification despite any potential discord between sources. However, “second-class” evidences provided from a particular database can be downgraded in the presence of alternative, lower-class (i.e. third or fifth) evaluations of the evidences provided from other sources for the same publication. Through this process, we assign two quality evaluations to each evidence: its original ("standard") and its "cross-checked" class. Accordingly, each interaction is given two confidence scores; the "cross-checked" confidence score of a PPI is based on the "cross-checked" quality class of its supporting evidences. The “first” standard PPI confidence threshold assigned a standard confidence score ‘1’ includes all PPIs supported by at least one evidence set of standard “first-class” quality. These PPIs are of high probability being direct, not subject to primary PPI dataset cross-checking; by definition their cross-checked confidence score will be '1' too. The “second” standard PPI confidence threshold assigned a standard confidence score ‘2’ includes all PPIs supported by at least one evidence set of standard “second-class” quality and none of standard "first-class" quality. These PPIs are of moderate probability being direct and are subject to primary PPI dataset cross-checking. Their "cross-checked" confidence score may remain the same, if not 'challenged' during the primary PPI dataset cross-checking process or downgraded to the third or fifth "cross-checked" confidence level, if ended being supported only by third or fifth "cross-checked" quality class evidences. The “third” standard PPI confidence threshold assigned a standard confidence score ‘3’ includes all PPIs supported by at least one evidence set of standard “third-class” quality and none of standard "first" or "second" class. These PPIs are considered of low probability of being direct. Their cross-checked confidence score may be downgraded to the "fifth-class", if ended being supported only by fifth "cross-checked" quality class evidences. The “fifth” standard PPI confidence threshold assigned a standard confidence score ‘5’ includes all PPIs supported only by "fifth-class" evidences. . These protein-gene or protein-nucleotide sequence (mRNA) interactions are stored in PICKLE for primary PPI dataset cross-checking purposes only and are not included in the PICKLE PPI network, thus they are not displayed in the PICKLE web-based querying interface. They are included in the 'Full' interaction datasets in the Downloads section. 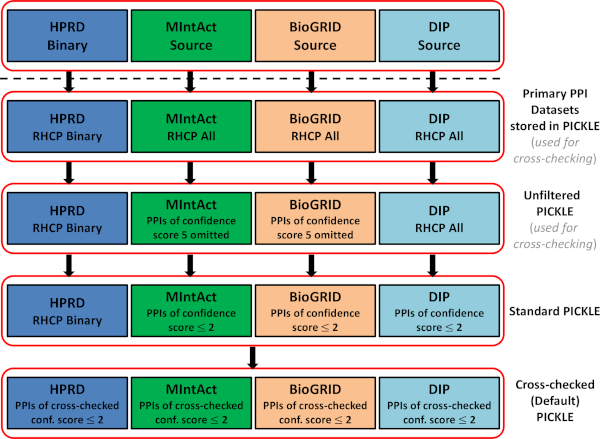 The HPRD, MintAct, BioGRID and MINT datasets included in the unfiltered, standard and cross-checked (default) PICKLE 2.0 PPI network are shown in the figure below. RHCP stands for the reviewed human complete proteome. The primary datasets stored in PICKLE involve solely associations supported by at least one experimental evidence set with linked publication(s), with both interactors designated as human and belonging to the PICKLE RHCP genetic information ontology network (available as 'Full' dataset in the Downloads section). PICKLE is supported by ELIXIR-GR structural funds. All data provided by PICKLE are subject to the licencing terms set by their contributing source databases. Despite our efforts for the correctness of the information presented here, we make no warranties either express or implied nor accept any legal responsibility for the correctness or completeness of this material or its application to specific factual situations or for its conformity with any applicable laws or regulations. All users implicitly acknowledge that they use the services and information provided here at their own risk.